Even though Blizzard believes in the power of microtransactions with World of Warcraft, the developer has no plans to include them with StarCraft II. Microtransactions are a part of World of Warcraft that isn't going to go away any time soon. Something that players have been wondering about, though, is whether extra StarCraft II content will be sold to players willing to spend a little extra cash. Fans can rest easy: Blizzard doesn't plan to use microtransactions in any way with its upcoming strategy game. At least, the company isn't planning to include them any time soon. Speaking to Blizzard VP Frank Pearce, GamesIndustry.biz was also able to learn about the change in the game's age rating in Korea. 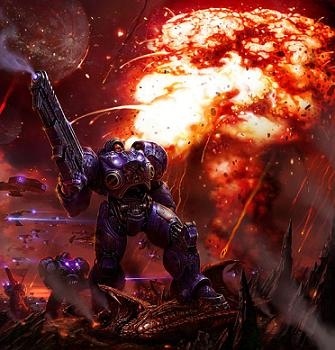 When asked about microtransactions, Pearce explained the rationale behind the exclusion, though he explained that they could appear in the eventual future: "I think micro-transactions probably don't make sense for a game like StarCraft II. Unless we decide to do something much more extensive with player profiles, then maybe we'll evaluate it." Meanwhile, when Pearce was asked about the game's status in Korea, he confirmed that the revised version had received a 12-plus rating. He also explained why Blizzard chose to make the revisions: "Well the biggest factor is that if you have an 18-plus rating, it's really hard to get the game into game rooms for people to play - and that's where a lot of people play games. So we want to make sure that we can get the game into as many people's hands as possible." From what Pearce said, though, it doesn't sound like the revised version is all that different from the build that was originally submitted. According to him, no one at Blizzard is entirely sure what change was responsible for lowering the game's age rating since, "we submitted a build with changes, and [the Korean Game Ratings Board] didn't really tell us what the big difference-maker was. We're just happy to get the rating."